In a week that began with AAU coaches basically admitting that recruiting is corrupt, some of the local colleges found themselves at various stages in the coach-hiring process. St. John's, for example, got turned down by Billy Donovan, and then — when it looked like they'd found their man — by Paul Hewitt, too. 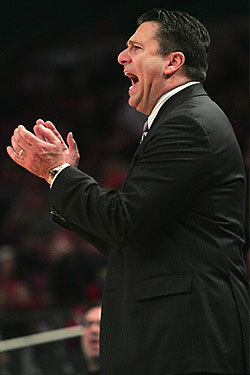 Fordham, meanwhile, was much more efficient, hiring Tom Pecora on Wednesday. (During his introductory press conference, Pecora made it clear that he's got the AAU-coach seal of approval, but not in a sleazy way.) But what happened this week that didn't set alumni message boards ablaze? Cornell won one for the nerds, but like Syracuse, they bowed out in the Sweet Sixteen. The Rangers lost all hope of making the playoffs, then they got a little hope back (in 3-D! ), and then they got a little more. The Knicks gave you a reason to keep watching. Phil Hughes won the fifth spot in the Yankees' rotation, while Joba Chamberlain became a "starter in the bullpen." We prepared you for Tiger Woods's upcoming visit to Augusta National. We counted down the tenth through sixth most important Mets. And we counted down the tenth through sixth most important Yankees. That's it for us. We'll see you Monday.